I am not much of a Halloween or Harvest decorator. If I could choose team colors they would for sure be red and green. That said, my really good pal Karen asked if I would make her a pumpkin. I said no (I always say no first for some grumpy reason), because I am not really into pumpkins but then she bribed me with pork. This may sound weird but Karen and her husband own Heilman Hogwash Farm, and that is some super yummy local pastured pork. She also knows that I LOVE trade. So exciting! 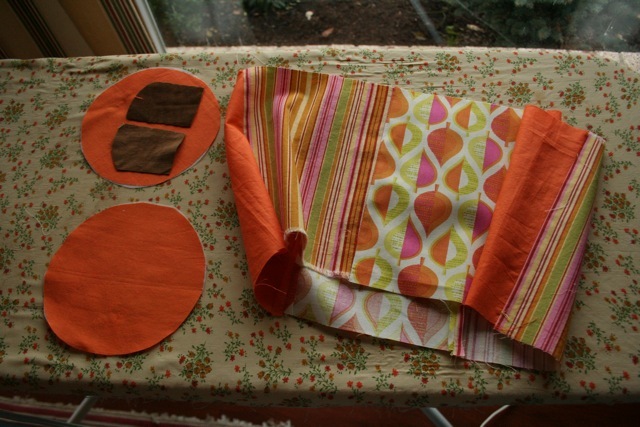 I made patchwork but you could do all one fabric or whatever. 6 pieces of 6" x 8.5" (or 8 4.5" by 8.5") pieces of orange print fabric. Sew them right sides together into a patchwork tube. Press the seams out with your iron. 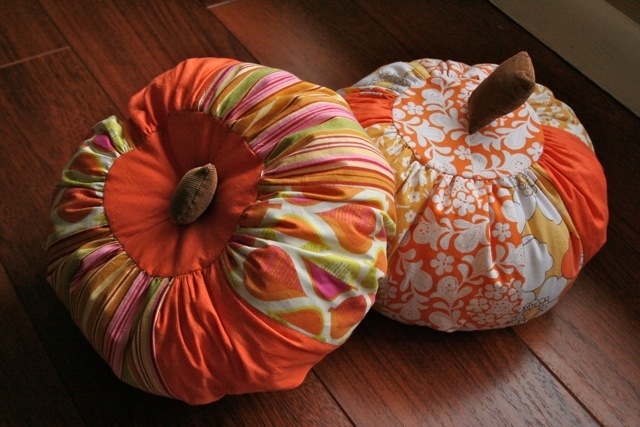 Cut out 2 circles (from Download Circle for pumpkin) in your fabric choices. 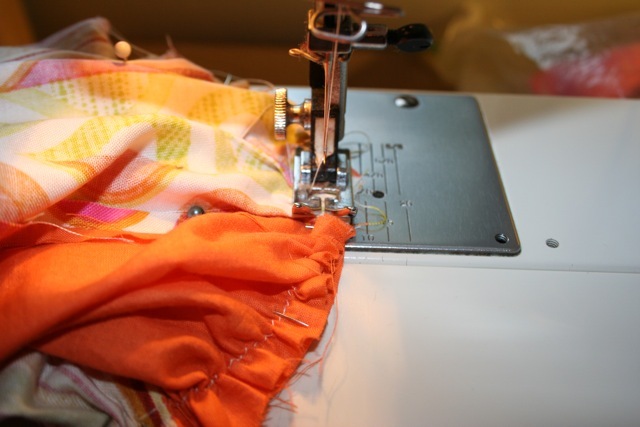 Fuse the wrong side with fusible interfacing. Cut 2 pieces of brown corduroy (or your choice!) that are about 2.75" high and 2" wide. 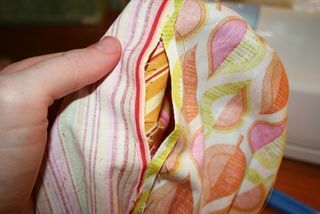 Now sew around the both the top and bottom edges of the tube with your longest straight stitch. Mine is size 7. Then gather both edges evenly. You'll have to mess around with this a bit to get it the perfect size but if you are technical, this circle has a circumference of 15.7". 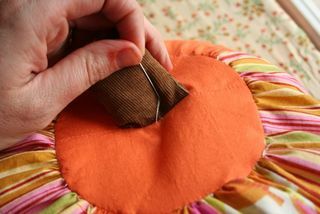 I just kind eye it up and make my gather bigger or smaller when i pin the circle on next. You can also see in this picture how I did the stem. 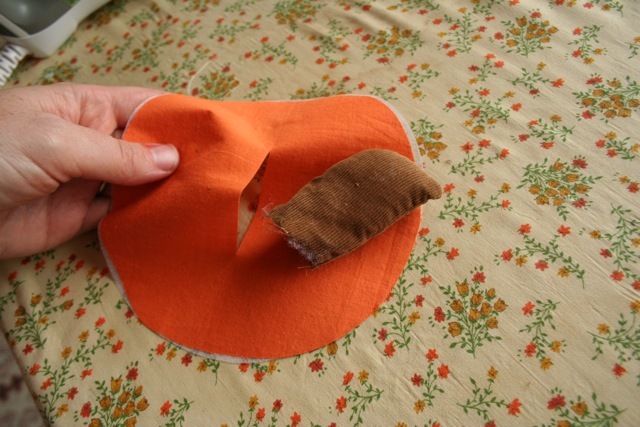 Sew those 2 pieces of corduroy together, right sides facing. I like to make the top edge kinda curved but this is not neccessary! 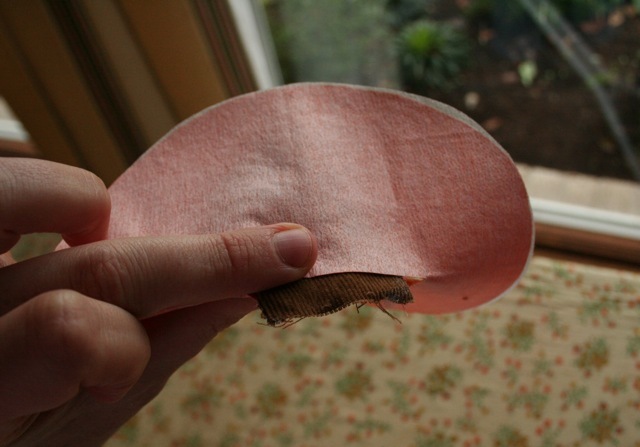 Trim the edges and then turn it inside out. Stuff a little stuffing in there and push it all the way to the end. You will even this out later. Next cut a slit about 3" in the middle of one of the circles and insert the stem. See picture below. 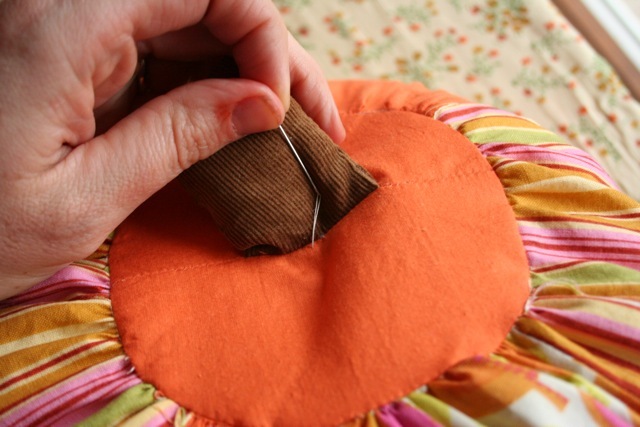 To sew it on, turn it over and pin the opening closed. Go ahead and sew all the way across the circle. Next you will attach the circle to the gathered tube. Pin wrong sides together all around and adjust if needed by pulling the thread tighter or loosening it as discussed before. 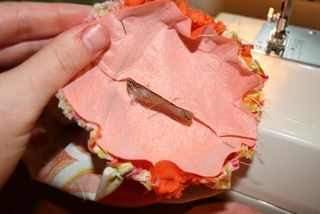 Now carefully sew all around. 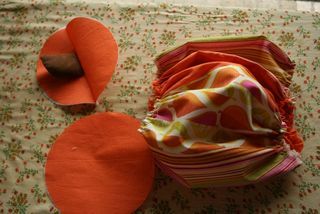 I sew on the gathered side so that I don't miss any edges. Check and make sure that you got all your edges nice and neat by turning out. Then back outside in again. Trim off all the string and mess. Repeat with the bottom circle. Use your seam ripper to make an opening about 3" between two of the patchwork panels. Now start stuffing! 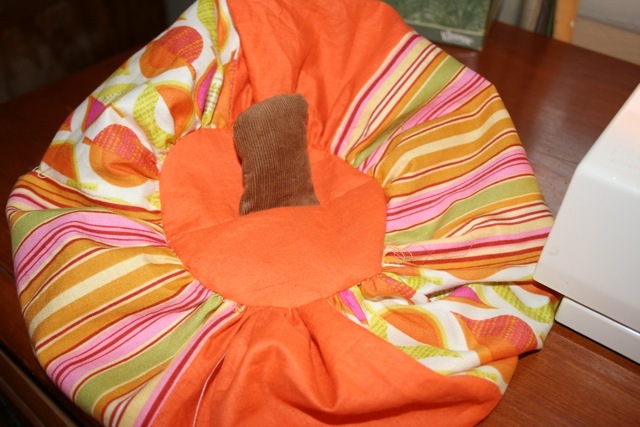 one of my favorite things about this project was that the stuffing can be loose and imperfect! Lumpy is good here! You want to put in enough in to fill it up though. Now sew up the opening with a blind stitch. Google it if you don't know how to do this! 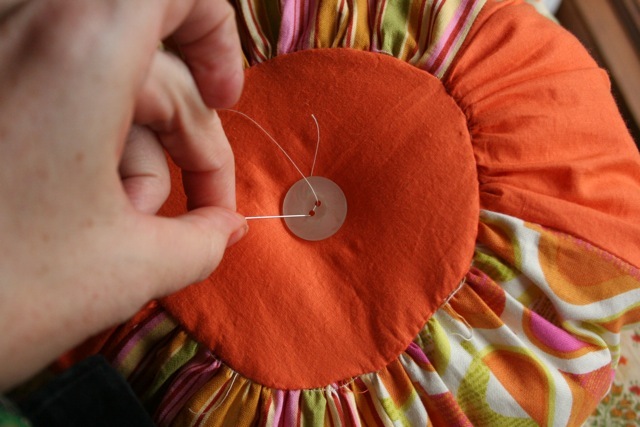 Very useful little stitch for sure. Here you have the option of being finished. Like with this one.. The stem is kinda floppy though so you can make the stem go in by putting a button on the bottom. Cute! I may like harvest decorating after all. Thanks for the push to inspiration Karen! Those pork chops are going to be great!!!!!!!!! Which one do you think she will choose? This is for personal use. 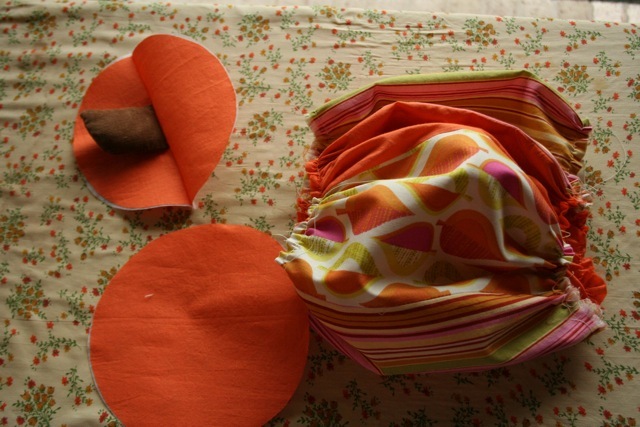 Make as many as you want for gifts and yourself. Contact me with further questions! They are so cute! Love the patchwork and the gathers! totally adorable, I want one!!! I LOVE them! Exactly what I was picturing!! Thank you my very talented friend. 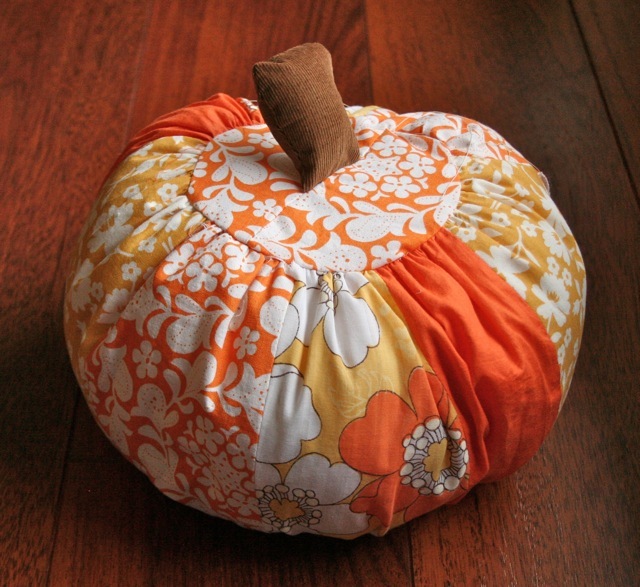 I have seen a TON of fabric pumpkins but I have to say yours are my favorite!! I think it’s because of the colors you chose and how you have the tops of them 🙂 Thanks for sharing! 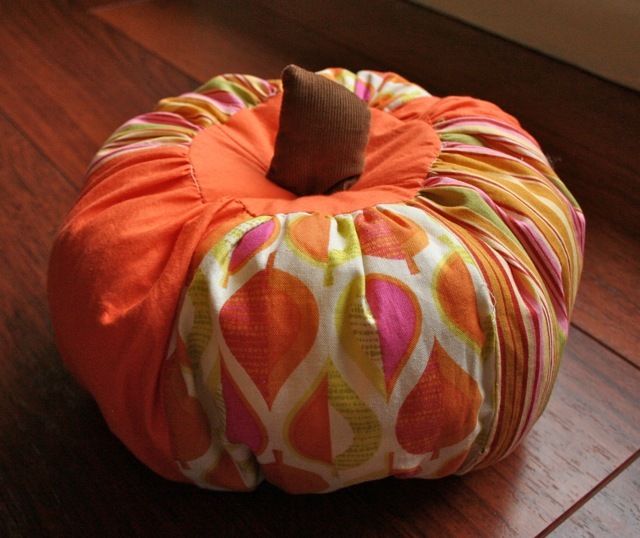 VERY cute pumpkin project. Thanks so much! This totally just jumped in line for my to make this weekend. Those other projects will have to wait. thanks! Really, really cute and easy! Thanks for your generous sharing! Adorable! I want to try one! 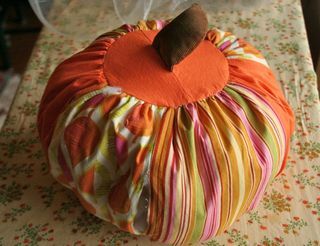 Great Tutorial Virginia, love the pumpkin ones, yours looks the easiest I have seen so far. Keep on with your tutorials. Adorable! I especially love the fabric you chose. Thanks so much for sharing. The tutorial was very well done and clear. Can’t wait to get started on the pumpkin for my Halloween decorations this year! Searching gratis grejer p ntet r ocks en av de bsta fritidsintressen i denna manslder. Till exempel hrnne ans eller personlig omvrdnad produktbolag vara villiga att erbjuda ngra av upphra att rinna produkter som gratis skyldig i Storbritannien eftersom de vet att om folk gillar dem d de kommer att kpa den i framtiden drtill p permanent basis. Vem som helst kan begynna auktionera med eBay. Signing dig gratis grejer glapp online r ganska enkelt. Soldes Chaussure Nike TN : http://www.chaussuresnike-vente.com/ Chaussures Air Max 90,Chaussure Nike Soldes,Chaussure Nike Soldes,Nike Pas Chere,Nike Shox Controversy,Lirvaison Gratuite! We Produce Sac Longchamp,spacy quality 2012 brand-new style Longchamp attach?case online,Sale-priced Longchamp Bag is stylish,?la mode and practical. Sac Longchamp : http://www.sortiedessacs.com/ Here you can get master excellence bags and higher,but at a tenable price.Longchamp satchel with the assure of 100% quality and lowest price.Free shipping! Welcome To Come by Our Popular Brand Want Champ Bags. with esteemed disregard online.We ensure super outrageous importance and lecherous delivery. L : http://www.jplongchampbag.com/ Our make contemporary Long Champ Bags start with sculptural physics and our unequalled three-point fit. Buy Dream of Champ Bag In Our Long Champ Sleazy Online With Newest Kind And Strong Characteristic, Get a kick Fast Shipping and Best Services.Long Champ Sale,We Confirm Wonderful Elated Je sais quoi and Promiscuous Delivery.We secure the goods are all the veritable ones,with wonderful altered consciousness quality.You should turn someone on a grand surprise and gaiety here.Welcome to do business with us. If you like monster beats, we can be your greatest selected because we afford Tinpot horror with expensive quality. ` ` : http://www.monsterbeatssjapan.com/ Crowded with high-quality miscreation beats, Monster Beats Studio, Monstrosity headphones, tight-fisted monster headphones. Mutation is earnest! Brute beats headphones complimentary shipping anywhere in the domain of Japan, 100% value word of honour! Gratifying To Buy Our Famous Tag Cram Bags. with socking discount online.We protect super euphoric excellence and dissolute delivery.The prepare bags here are all the legitimate ones,with wonderful high-pitched quality.Welcome to bribe the bus bags here.You must journey by a distinguished buoyancy here.May you be happy here. ` : http://www.jpbags-sale.com/ Our brand new Omnibus Bags start with sculptural physics and our unequalled three-point fit. Bribe Tutor Bags In Our Tutor Bags Escape hatch Online With Newest Line And Stiff Status, Fancy Fast Shipping and Most talented Services.Coach Bags Sale,We Certain Wonderful Costly Supremacy and Rapid Delivery.We ensure the goods are all the trustworthy ones,with exceptionally super steep quality.You sine qua non after a illustrious catch unawares and rapture here.Welcome to do topic with us. It’s likely they will move on to the next property with hopes of speaking to a live person.